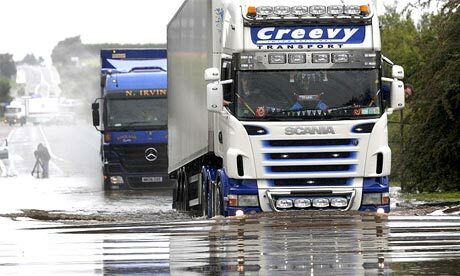 What service will politicians provide in response to floods? When politicians ask themselves what service they can give to the people in the context of the flooding crisis, it pertains to what should be done in the future. In part, Members can give voice and have a role in giving voice to people who are faced with this situation on a daily basis. I refer to those whose homes and lives have been destroyed or almost destroyed in many cases. While this is important, others such as the media can do it as well and people can do it themselves. One can see and hear the frustration of people on radio and television. However, politicians operate in a completely different context. Most importantly, their role pertains to deciding what to do to ensure such things do not happen again. Otherwise, they have no real role. Members have been debating the Planning and Development (Amendment) Bill in this House in the past week or two. I consider it to be good legislation in the main and my party has made this clear in the course of the debate. If memory serves, it includes a reference in the context of development plans to the risk associated with flooding. The Minister needs to re-examine this legislation in the context of returning to this House on Report Stage and subsequently to the Dáil, to ascertain whether it can be strengthened further. I wager that in practically every case in which houses and developments have been built on flood plains over the past ten to 15 years, some lone voice who stood up to argue against it was told he or she was anti-investment, anti-building, anti-progress or anti-something and was shot down over it. From my personal experience of being on a local authority in an urban area, I know this is what happens to people who raise genuine issues, including people in my party and in this House in respect of improper, ill-advised and inappropriate development and planning carried out in an improper and unsustainable way. This is the difficulty we face. It is not simply about the weather. Some people across this debate like to suggest this is about the weather and that the Government has no control over it and so they throw their heads back. However, John Gibbons published a good piece in yesterday’s The Irish Times, reminding his readers that this crisis does not follow from a particularly serious period of storms. It has to do with our woeful lack of preparedness in many parts of the country. The kind of debate Members must have as politicians is to ascertain what service they will provide to the people through the planning system and otherwise to ensure there is no repetition of what has happened in recent days, rather than simply giving voice to the genuine hurt that exists. Last Sunday, I featured in an item on RTE’s This Week programme regarding Child Benefit. You can listen to the report by clicking here. Yesterday, the Bill that will introduce NAMA began its journey through the Upper House. The Government have insisted that the legislation must be back in the Dail by Thursday, giving the Seanad three days to deal with the Bill. Below is my Second Stage speech. Keep with the site or with the Facebook page for further updates. It is true there are no certainties in this matter. There can be no certainty on anybody’s part. In particular, the Minister cannot be certain that what he hopes will occur will actually transpire. There can be no certainty associated with the assertion that matters will come right. None of us can be certain with regard to what is going to occur. That is a measure of how momentous and serious is this debate. We have reached the 11th hour and the Government has signalled that the legislation will return to the Lower House on Thursday, which constitutes a curtailment of the debate in this Chamber. In such circumstances, there is a sense of inevitability regarding Members’ approach to this debate. However, this should not mean we should set aside our serious and genuine objections to what the Minister is proposing. Like other Senators, I recognise the Minister’s good faith about the way he has approached this matter. I sometimes feel uncomfortable making that point in respect of Government Ministers. I assume good faith on the part of members of the Government, whereas other Senators often use half of the time available to them to inform a Minister that he or she is a great man or woman. I operate on the basis that the Minister for Finance is doing a professional job for the country and believe this is also the basis on which he operates. He does not, therefore, require to be congratulated. In so far as it is important to say so – particularly on a personal level – the Minister’s input has been considerable, if wrong-headed, in recent months. However, that input has been solely motivated by the need to act in the very best interests of the country. Unfortunately, in the context of what has occurred in the past 15 years, the Minister is dealing with a legacy created by the Government and his party, as a component thereof. It is fine for Senator MacSharry to express his frustration and annoyance that this point continues to be raised. I will not treat him to a few minutes’ worth of material on the Galway tent. Owing to time constraints, I will not refer at all to the history of Fianna Fáil, its associations, etc. but if I had time, I would gladly do so. I am referring to Fianna Fáil as the party of Government; I am not dealing now with its historic links with the building industry or anything else. Fianna Fáil was in office when our current difficulties emerged. It was in power when my party brought forward proposals in the late 1990s to examine the matter of house prices. At that time my party argued, in trenchant terms, that there was no requirement to amend the Constitution in order to implement the principal recommendations made in the Kenny report which was published over 35 years ago. These issues were canvassed and debated during the lifetime of the last two or three Administrations. It is not satisfactory for those opposite to simply state they are not to blame and that everything happened around them and that they had nothing to do with it. That is simply not the case. I am afraid it is not credible to say that by his statement at the weekend the Taoiseach has got himself into the driving seat. The Taoiseach has been in the driving seat for 18 months in this country. Prior to that, he was in the seat beside the driver as he was in the Department of Finance for an extended period. I am not prepared to go along with the notion that the Taoiseach now has credibility on public sector reform. He just does not have that credibility. There is a cabinet sub-committee that is supposed to be meeting on this issue for the last year and a half, but the Taoiseach could not even answer the question yesterday on whether that committee had met. I understood from his response that it has not met. It is no use saying the Taoiseach has now put himself into the driving seat. The Taoiseach has had every opportunity for 18 months and more to address these issues, but he has failed to do so, along with his Government. It is perfectly legitimate for people to criticise the public service and to call for reform, as I have. The problem is that the debate has become suffused with anecdote, prejudice and worse. Everybody has their story about the public service and what should happen. However, the Government gets to do more than what we get to do, which is to come in here and call for things to happen. It is ludicrous for RTE to report the Taoiseach as “calling” for public service reform. That is what we do in here. We call for things but unfortunately we have little or no power to deliver them. The Taoiseach does not get to call for things. He gets to do things. That is why he is the Taoiseach. We should forget about calling for things and expressing wishes. Let us have a balanced review of the problems that exist and of the issues in the public service that require reform. That can be done in a relatively short period. Let us then have some action on the issue. People who are marching on the streets are being told they are the problem, but they are not the problem. Cuts do not amount to reform. If people are serious about reform, let us have a balanced assessment on what needs to be done and then let us have some action. I featured as a guest on Today FM’s Sunday Supplement with Sam Smyth yesterday. The other panellists were Mary O’Rourke TD and Senator Shane Ross. You can listen to the show in full by clicking here. The revelation that the leading children’s Special Care Unit in Ireland must close is yet another example of the State failing children, according to Labour’s Spokesperson on Children, Senator Alex White. “The Minister for Children must explain how conditions at the Special Care Unit in Ballydowd became so unacceptable that there was no option but to close. I would question why it took the HIQA inspection report to recommend ‘urgent action’, before this issue was raised with the Minister responsible. “The report highlights the ‘serious difficulties of trust’ between management and staff. This was taking place at what was meant to be the leading care unit in the State. It appears that the failure began when the €13 million facility opened only nine years ago. “There must be immediate assurances that the children currently in the care unit are transferred in a dignified and safe manner. In respect of the day of protest scheduled for this Friday and the general issues pertaining to the trade union response to events, members of trade unions are perfectly entitled to take a day of action and to protest on the streets of their capital city. Not only are they so entitled but they are perfectly justified in so doing. Every time one makes a point about, for example, NAMA or some other issue pertaining to the economy, Members on the Government side ask, perhaps justifiably, what is one’s alternative. Practically five minutes into a discussion on the subject, the refrain from Members on the other side is what is one’s alternative. I ask those who criticise trade union members who are taking to the streets and considering industrial action what alternative do they propose. What alternative do they propose to people who can see their living standards have dropped and who can see no real stake in the future? The problem people have is there is no clarity and they can see absolutely no stake into the future regarding how these issues should be dealt with in budgetary terms. What alternative is proposed by those people who fill the airwaves with criticisms of trade unions being lunatics and everything else? I refer to next week’s business dealing with the NAMA legislation. The Government has already made it clear publicly that it intends to curtail debate in this House. It announced the legislation would return to the Dáil on Thursday week, 12 November. It has already made it very clear that the debate will finish here on Wednesday night. That will amount to the guts of three days’ debate in the House. We know that decision has already been made. It is intended to finish the debate on Wednesday night or Thursday morning next week. It is odd to read in the newspapers today that the Minister for Finance intends to introduce further amendments, amendments that are so complex – I understand this is the way in which it has been reported in the newspapers today – that he is not in a position to introduce them this week. He requires more time and will not be able to introduce them until next week and he will do so in the Seanad. If he must take a further week to devise and deal with the amendments, how are we expected to deal with such complex matters in a period of one day or one day and a half? We will do our best to do so but it is extraordinary, since there have been months of preparations for this legislation. However, the Government seems to take the view that when legislation goes to the Dáil and to Seanad in particular, this constitutes the end rather than the beginning of the debate, and that the real work is done by the Executive, not by the Parliament. The Government has taken this position and if I am wrong in this regard, I ask the Leader of the Seanad to disprove my point. The Deputy Leader also might agree to my proposal, which is to publish the amendments at the end of this week. The Leader should not wait until Tuesday morning to publish them but should enable Members to see them. This at least would give Members a couple of days to consider these complex amendments and an opportunity to deal with them when they come before this House. The Government should consider this not unreasonable request.